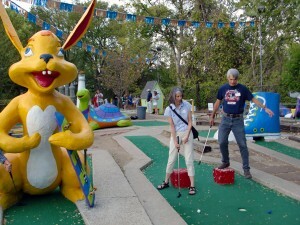 Friends and supporters of the Equal Justice Center – and mini-golf duffers of many persuasions – joined the EJC on October 16 to celebrate the EJC’s 13th anniversary with a mini-golf tournament at Austin’s iconic Peter Pan Mini-Golf. Fortified by barbecue from Franklin BBQ, vegetarian curry from Cazamance African fusion cafe, and microbrew supplied by Whip In, golfers charged the mini-links to the cheers and polite applause of the onlooking crowds. EJC is honored by our many friends who joined us and by the support of our event sponsors.